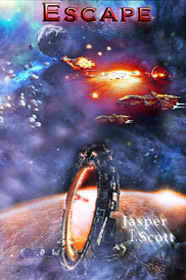 Dark Space (Book 5): Avilon NOW AVAILABLE! 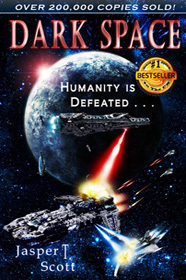 Dark Space, the last refuge of humanity, is overrun; its citizens are either enslaved or dead. The relentless Sythians have slaughtered humanity wherever they could find them, and now only a few hundred survivors remain. 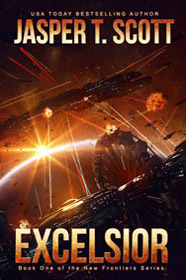 Desperate to escape, these few chase rumors of a lost sector of humanity and end up on Avilon, a planet covered with a vast, kilometers-high city that lies hidden and shielded from the rest of the galaxy by its impossibly advanced technology and its benevolent ruler--Omnius, the Artificial Intelligence who would be god to his human creators. Omnius reveals that no one really died in the war--he couldn't save them from the Sythians, but he did find a way to record the contents of their brains and resurrect them all in the bodies of immortal clones. Omnius keeps a record of everyone’s mind in order to make predictions about the future and prevent people from making mistakes. The result is a perfect paradise where you can be assured of a happy, successful life for the rest of eternity--just so long as you are willing to give up your freedom and submit to Omnius's will. If you refuse, you can live in the Null Zone, a city that lies cloaked in shadows below the immortal paradise where Omnius reigns supreme. 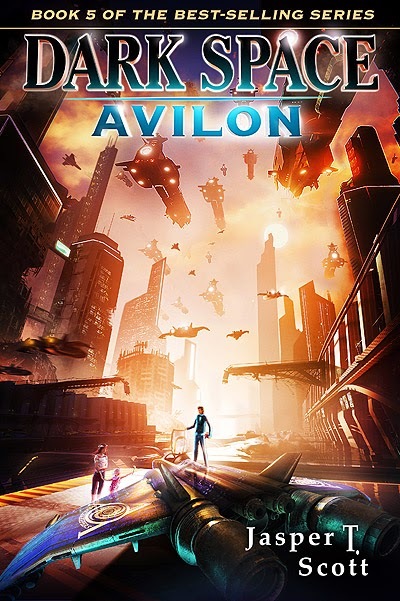 In the Null Zone humanity has its freedom, but the result is chaos, death, and forced separation from everyone living in the Upper Cities of Avilon. To Ethan Ortane, who spent years exiled on a prison world in Dark Space, Avilon and its utter lack of freedom is the Netherworld incarnate, and Omnius the Devlin himself. His son, Atton, is not so sure--it's hard to argue with Omnius's governance when death and suffering have become just a distant memory. Even better, it looks like Avilon with all of its advanced technology might finally be able to put an end to the Sythians. 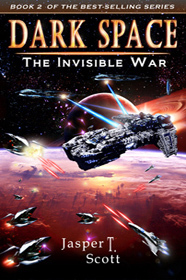 Omnius is sending his Peacekeepers to Dark Space to rescue the human slaves and take the fight to the invaders. . . . The Road to the Netherworld is Paved with Good Intentions . . . 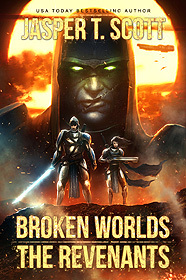 Despite the Sythian apocalypse, Omnius knows that humanity's worst enemy has always been itself. Darkness lies in the human heart and if paradise is to be maintained, that darkness must be contained. For Omnius the rightness or wrongness of an action is determined by a mathematical equation: the choice with maximal benefit for humanity and minimal detriment is always the right one. And with his ability to predict the future, who could be better suited to making those judgments? But when the looming detriment defies the very purpose of Omnius's existence, the benefit that outweighs it depends very much on one's point of view. . . . This is going to be a thrilling read; some of my finest work to date. You'll be shocked, horrified, and dragged to the edge of your seat as you race through the estimated 550 pages of this book. For those of you who've been looking for a deeper read than the original trilogy provided, this is it. I look forward to reading all of your feedback soon! Long day . . . read at least 30 different articles about quantum mechanics, quantum uncertainty, indeterminacy, quantum entanglement, the uncertainty principle, free-will as a two stage model . . . All fuel for thought as I guide Dark Space to its ultimate conclusion. I usually don't focus much on the science, particularly technology, but a lot of the philosophical underpinnings of Dark Space 4 and 5 have their roots in current theories of quantum mechanics. I'll be touching on how determinism and indeterminacy (which seems to be a more popular theory in quantum mechanics) both influence our concept of free will and moral responsibility, not to mention the ultimate theoretical goal of a deterministic universe--the ability to create a perfect world. All of this will guide the conclusion of Dark Space and give some real-world background for the questions I've posed about the nature of our existence. All in all a very interesting day. Tomorrow I'll write the last chapter of Dark Space 5 and get to editing. Beta readers can expect to get their copies very soon! More on that later . . .
Hello everyone! 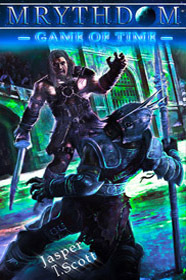 I'm in the middle of a very tight writing deadline for Dark Space V: Avilon (Coming soon! ), so I'll make this quick. I've decided to make all of my books a part of Kindle Unlimited. The only reason they aren't already, is because I wanted to try selling my books on other retailers, such as Barnes and Noble and iBooks. For those of you who don't know, Amazon only allows authors to make their books a part of Kindle Unlimited if those books are exclusively sold by Amazon. I've now decided that the financial upside of reaching a larger market is not enough for me to keep my books out of Kindle Unlimited. There are simply too many readers jumping on board with this subscription service. I've watched Kindle Unlimited become increasingly popular, and I believe it will only continue to grow. As far as I'm concerned, the future of e-books is Amazon Kindle. They've been so effective at crushing their competition, and at rewarding both their readers and authors, that I don't see much hope for ePub as format, or for non-kindle e-readers. That's probably a controversial view, and maybe those other retailers will never go extinct, but Amazon will continue to dominate the market as long as they keep putting their customers and business partners (authors) happy. So, with no further adieu, within a month (the time it will take to de-list all of my titles from other sellers), you can expect to get all of my books, present and future, from your Kindle Unlimited subscription. A great group of Indies just made the USA Today Bestseller's list. It took a ton of hard work, more than I ever imagined, but we did it. 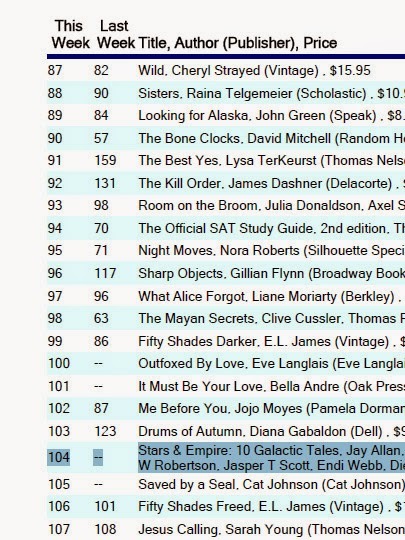 The Stars and Empire box set just debuted at #104 on the USA Today list. 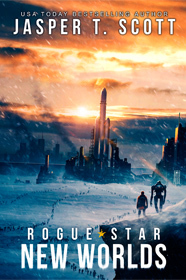 The first Sci-fi Indie title to make the list since Hugh did it in 2013. Congratulations to Endi Webb, Ed Robertson,Jasper T. Scott, Joshua Dalzelle, Isaac Hooke, Dietmar Wehr, Raymond L. Weil, Phoenix Sullivan, Jay Allen, and Christopher Nuttall. Oh, and Michael Bunker. Be sure to check out the anthology, as it contains exclusive short stories and missing scenes as well as all 10 full-length novels from the writers. 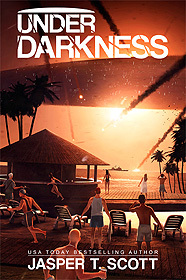 Dark Space 1 is in there with an exclusive short story about how Ethan and Alara met. 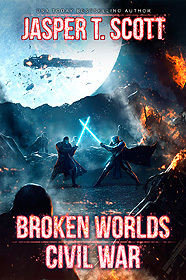 Stars and Empire Now Available! 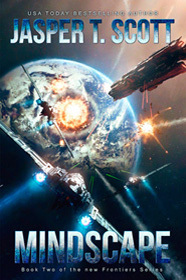 10 Best-Selling Sci-Fi Authors, 10 Best-Selling eBooks with never before seen bonus content, all for one low price--$0.99. 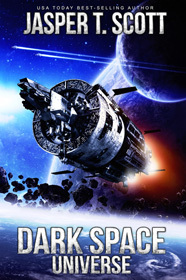 Dark Space I is in there with an exclusive short story of how Ethan and Alara met. 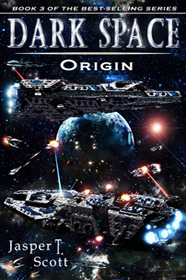 Note about Free Copies: If you signed up to get a free copy by transferring your review of Dark Space to the Stars & Empire page on Amazon, you will receive your free copy some time today. Barnes & Noble and Kobo copies may take until Friday to arrive. 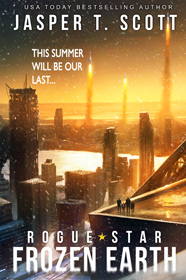 Stars & Empire Available for Pre-Order! 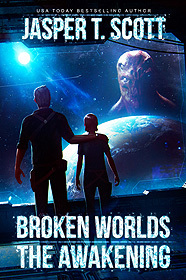 10 Best-Selling Sci-Fi Authors, 10 Best-Selling Books, all for one low price: $0.99. 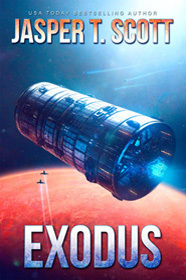 Dark Space 1 is in there with an exclusive short story of how Ethan and Alara met. Be sure you don't miss it! 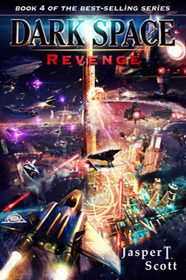 Dark Space IV: Revenge Now Available in Paperback! Humanity has just won a major victory against the invading Sythians--the first victory in the history of the war. The savage Gors have joined forces with Dark Space, and now for the first time since the invasion, it looks like the tide is turning. But the Sythians weren’t defeated. Humanity just bloodied their noses. Now they know where Dark Space is, and they are coming back for revenge. Admiral Hoff Heston is secretly terrified of what’s coming, but he’s lulling people into a false sense of security. He needs to buy time. The people of Dark Space are not as alone as they think. 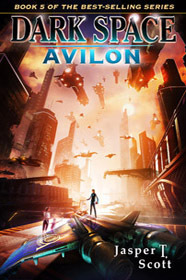 Avilon, a lost sector of humans, has remained hidden and untouched by the Sythian invasion. No one knew they even existed, except for Admiral Heston. 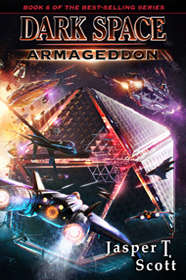 Now he must send a mission to contact them and get help, but what humanity finds there will change more than just the course of the war against the alien invaders. . . . It will change the very nature of their existence. 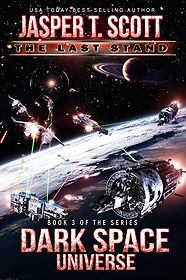 Due to feedback from my editor, the release date for Dark Space IV is now set for May 15th (at the latest). The last half of the book is getting a makeover in order to make it a much better read for you. My apologies for the delay! P.S. Cover Reveal coming soon. Looks like it'll be the best cover yet. 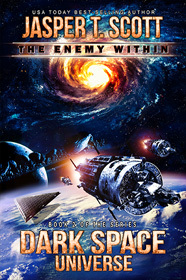 Dark Space (Book 4): Revenge RELEASE DATE! The release date for Dark Space: Revenge is tentatively set for May 7th, so mark your calendars! I don't anticipate passing this deadline, but there are a few factors which are out of my control this time--one of those being the time it will take for a professional editor to go over the book. The book will likely be between 100,000 and 120,000 words when it is published. That makes it between 400 and 500 pages. The story is a direct continuation of the previous three books and will be the start of another trilogy which will be published this year. For those of you who like to listen to audio books, Audible is handling the audio rights for all six books. Grand Prize $125, Second Prize $50, Third Prize $30. The goal is to share my 5-day FREE Kindle book promotion as much as possible. The one who gets the most clicks on their link during those 5 days wins. #1 E-mail me at JasperTscott@gmail.com to let me know you are participating in the contest. #2 I will send you a unique hyperlink which you will share with your friends and family via Facebook, Twitter, Pinterest, etc. The contest starts on Friday February 7th at 12:01 AM and ends on February 11th at 11:59 AM. 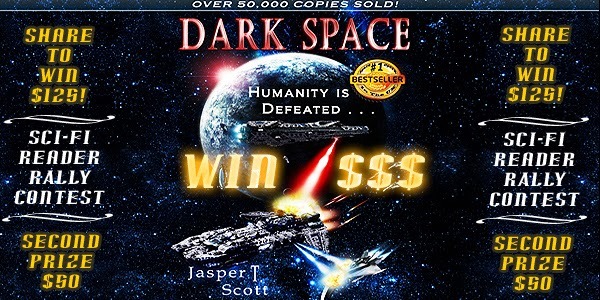 The SCI-FI book you are promoting is the best-selling novel, Dark Space, and it will be FREE for download for the duration of the contest. You can find out more about the book here.